If you’re like most marketers, it would be a dream come true to make more money without doing any extra work. 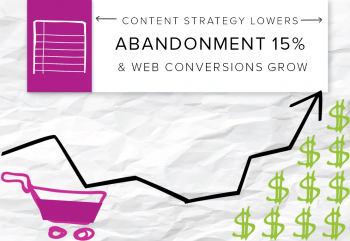 Relatively speaking, that’s what one of our clients did by reducing its shopping cart abandonment rate 15 percent with a blog content strategy. According to a smorgasbord of research compiled by the Baymard Institute (you can see the list of studies and stats for yourself here), the average shopping cart abandonment rate in 2015 is a little over 68 percent. This means two out of three people who visit a site, find items they’re interested in and add them to their carts, don’t end up buying. Compare this to a brick-and-mortar store- if people were picking up items, bringing them to the register and then changing their minds, retailers would be taking drastic measures to improve their customer experience. But, because it’s the internet and we know the buyer journey is a tangled series of cross-channel interactions, ecommerce companies don’t always make the changes that could keep people on their sites and increase revenue. One of our clients has an ecommerce site that sells products to retailers. The marketing team understood content could give the brand a competitive advantage by helping it rank better in search and drive traffic the website. What they may not have anticipated is how the blog content would impact engagement and, ultimately, online conversions. Enter: Blog content. Throughout the course of our content marketing partnership, we’ve recommended strategic changes to fine-tune the articles on the site to align with the target audience’s needs and expectations. Once the number of blog visitors had grown to account for a substantial amount of the site’s overall traffic, we felt confident moving in a direction that would encourage deeper engagement. This entailed easing off of the article quantity (and losing some keyword volume) to produce longer pieces that dove deeper into the subject matter. Included in these new in-depth articles were custom visuals and pull-quotes, which are proven ways to make your site stickier. We were even seeing that conversions continued to increase during the business’ traditionally slow season. This suggests people who are already engaged in the blog are returning to make purchases, or the readers who ARE filtering in are converting at a very efficient rate. They’re visiting the site, finding what they need and making purchases. Now that we’ve made significant strides in getting the most value from the company’s marketing content, we’re looking for other opportunities to improve. A few simple graphic updates can make call to action buttons 40x more successful, which means 40x more goal completions. By moving a “Buy Me” button into better website real estate or adding new call to action at the bottom of an article, we can further whittle down the abandonment rate and generate more money with the website. And the company’s marketing team hardly has to lift a finger.